18. GOIN' BACK TO L.A.
Like so many of his peer group, Johnny Otis seemed to appear out of nowhere at the dawning of the rock'n'roll era. To all intents and purposes he was yet another exciting new artist to lap up when Capitol Records brought the Johnny Otis Show to public attention in 1957. There was little chance however, that anyone outside of America would have known that when 'Ma (He's Makin' Eyes At Me) was making its way up the charts, the ubiquitous Mr. Otis was already celebrating his twelfth year in the recording industry. John Otis was born to Greek/American parents, Alexander and Irene Veliotes, in Vallejo, California on 28 December 1921. He was raised in a black neighborhood in Berkeley and by his eighteenth birthday his musical talents were sufficiently asserted for him to be hired to play drums with a popular local outfit, Count Otis Matthews' West Oakland House Rockers. After toying with the idea of becoming a Pullman porter in Denver, Johnny relocated to Los Angeles and in 1943 joined a popular territory band known as Harlan Leonard's Rockets. Two years later, his unabating desire to promote blues and jazz encouraged him to form his own outfit which he dubbed the Johnny Otis Allstars. With the billing amended to Johnny Otis, His Drums and Orchestra,they cut a version of 'Halem Nocturne' for Excelsior that became so successful it even warranted a British release. Reinforced by this positive devilment he struck up a business partnership with his new manager, Bardu Ali, to further progress the music he was now calling "Rhythm and Blues". In early 1948 they opened their own nightspot in the south LA district of Watts, and christened it the Barrelhouse. Situated on Wilmington and Santa Ana, the club offered its patrons a sawdust floor, barrels for tables, cartoon images on the walls and a solid diet of the newly-fashioned R & B. The club soon became a focal point of the new movement and it also provided Johnny with the opportunity to audition some of the local talent. When he hooked up with producer Ralph Bass in late 1949 and signed a recording deal with Savoy, he took with him two of his most recent discoveries, Little Esther Phillips and the Robins. It proved to be an inspired move and no less than seven Top 10 hits, including two number ones, ensued across the next twelve months. Johnny realized a major ambition when he launched his Caravan Of R&B Stars in 1951 and his touring revue gave audiences across the States a first hand opportunity to soak up what was fast becoming a highly popular format. It was certainly an epoch making time as Johnny's keen eye was constantly finding and developing future stars like Jackie Wilson, Hank Ballard and Little Willie John. There was a short tenure with Mercury in the summer of 1952 followed by a brief stab at running his own company, Spin Records. Far more lucrative though, was a deal he struck with Don Robey's Peacock label out of Houston. The agreement called for the Otis Band to back a large number of artists contracted to the company and supply the finished masters. Across the next three years Johnny was working with a variety of hopefuls, including a young Little Richard, but it was the top selling 'Hound Dog' by Willie Mae Thornton and 'Pledging My Love' by the ill-fated Johnny Ace that really helped to open the door. By 1955 Johnny Otis' creative energies encompassed running a record store on Western Avenue, hosting a daily radio show on KFOX, presenting a weekly TV program for KTTV and promoting a highly successful Saturday night residency at the El Monte Legion Stadium. Amidst all of this frantic activity, Johnny's entrepreneurial spirit entered a new phase when he finally launched his own label later that year. The initial releases were issued on Ultra but that soon changed to the more hip-sounding Dig, obviously with a teenage audience in mind. He made his tenor player, Jackie Kelso, A&R manager, a musician who was more than capable of cranking out a session in the morning and having a 'dub' ready for Johnny to play in the afternoon. This would have been an almost utopian scenario if the age-old problems of distribution hadn't blighted the situation by 1957. When the company was forced to close, a welcome stroke of luck came Johnny's way. Hal Zeiger, who worked on the management side of the Otis organization, brought along comedian Mickey Katz to see one of Johnny's shows. Katz was a seasoned laughter-maker who had made a successful career in the world of Yiddish humour and he was highly impressed by what he saw. The Johnny Otis Show now comprised a full rock'n'roll band with singers Mel Williams and Marie Adams as well as vocalists Jeannie Sterling and the Moonbeams, and comedian Little Arthur Matthews. 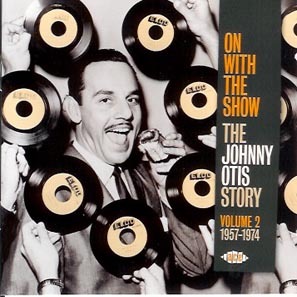 Mickey Katz, who had been with Capitol Records since the late 40's, placed a call to the company and the Johnny Otis Show found itself with major label interest. Capitol producer Tom Morgan had been aware of Johnny since he'd seen him play drums for the Lloyd Hunter Band back in 1941. His main role at the company had been working with big bands like the Glen Gary Orchestra, but he was intrigued by the rock'n'roll fad and he signed the Otis revue to the label in the summer of 1957. He hatched a clever plan to give the Johnny Otis Show some very necessary teen appeal and he arranged for a mobile recording unit to be set up in order to capture all the excitement of one of Johnny's live shows. The Orpheum Theatre in downtown Los Angeles was duly booked for the middle of August. On the day of the recording the audience, who had earlier been invited by Johnny on his radio show, demonstrated the power of its collective lungs by hollering throughout the proceedings and the Capitol engineers simply had to give up in despair. Fortunately the hall was hired for a further day and they were able to salvage some of the material- this time though, with the public kept at bay. They then returned to the Capitol Tower in September to record a further batch of songs, ironically closing up the session with the first number "Shake It Lucy Baby." Johnny hauled in another member of his organization, Red Gilson, to provide a voice-over and they edited his long, drawn out introduction on to the track. Tom Morgan had also booked some key studio players to augment the band and Earl Palmer came in on drums along with Plas Johnson, whom Morgan had worked with on the Glen Gray albums, to share the tenor solos with bandleader Jackie Kelso. Of the sixteen recordings achieved from the first two sessions, ten of the titles were supplied by Johnny himself. On several of the songs, he incorporated the name Darby Hicks as a co-writer, which was a pseudonym (derived from a slang term for the husband of an unfaithful wife) that was used whenever Johnny's El Dorado publishing company was administering the material. Capitol showed the strength of its commitment when the company issued no less than four singles simultaneously in October 1957, making sure that the various individuals of the revue were all highlighted. Johnny's single coupled two self-written rockers, whilst Mel Williams and Jeannie Sterling covered a pair of old Orioles' hits. The main interest though was reserved for Marie Adams and the Three Tons Of Joy. This was the release that was going to be the linchpin. Marie was a hometown girl from Lyndon, Texas who had first recorded for Peacock in 1952. After her debut single (an earthy blues entitled 'I'M Gonna Play The Honky Tonks') hit the R&B Top 10, she became one of the many artists to benefit from using Johnny Otis' Band whilst they were in Houston. By the mid 50's she had joined the revue and relocated to LA where she recruited her sisters, Sadie and Francine McKinley, to form the Three Tons of Joy. One of the unlike tangents of the newly emerged rock 'n' roll scene, was the 'jiving-up' of tin pan alley standards. Fats Domino had proved the worth of this theory many times over and the ever-aware Mr. Otis no doubt had this on his mind when he came up with the idea for 'Ma (He's Makin' Eyes at Me)'. Initially he had to coax the girls into tackling the oldie, but his teen-slanted arrangement pulled it all together . Producer Tom Morgan sensed they had come up with some of the wild audience reaction he had taped that first night at the Orpheum. They certainly got the reaction they were looking for, but not on home territory. EMI in the UK, who had taken over the licensing of Capitol from Decca the previous year, were convinced they had a hit on their hands. They placed ads in the trades and even obtained a clip of the Otis Show performing the song on Johnny's American TV programme, which was aired on both the BBC's Six Five Special and across the new ITV network. There was a marked contrast in how the record was received. The Melody Maker in its review pages called the single "organized bedlam on the Grand Guignol Scale" - but the teenagers however, knew different. They bought it in their thousands and so did many of their parents. Whether by coincidence or design, the song had struck a nostalgic chord with the older generation, rekindling memories of singing the chorus to raise their spirits during war-time air raids. By January of 1958, the Johnny Otis Show were right at the very top of the UK charts. EMI moved quickly and rushed out a duet between Marie and Johnny entitled 'Bye Bye Baby.' This cleverly-crafted little rocker headed off into the best sellers, just as Hal Zieger boarded a plane to London to discuss the arrangements for a Johnny Otis Tour. Unfortunately, the draconian rulings then applied to work permits for musicians prevented any chance of a British visit. Fortunately, Zeiger's field trip would prove to be beneficial in a totally unexpected way. While he was in the country, he'd noticed how the coffee-bar set were hung up on doing what they called the Hand Jive. What had started as a simple teenage fad had caught on in a big way once the media had gotten ahold of the story. On his return to the States, Zeiger told Otis what he had seen and suggested he write a song all about this craze. When Johnny came back with the results, Zieger was so unimpressed he literally tore up the song sheet and trashed it. Tom Morgan had other ideas and retrieved the ripped pieces, carefully sticking them back together. Like Johnny, he thought the song had great potential and together they set out creating 'Willie And The Hand Jive.' For some time Johnny, along with several other rock'n'roll artists on the label, had been expressing doubt about the recording conditions at Capitol Tower. With the invaluable studio experience he had garnered across the previous decade, he'd made key suggestions to the Capitol engineers, but most of the time was politely asked to leave it to 'those who knew.' Inevitably this resulted in a highly frustrating situation, so after some high level discussions, Tom Morgan managed to secure the far more appropriate surroundings of Master Records on North Fairfax to record the hot new song. The source of the catchy rhythm Johnny Otis applied to the 'Hand Jive' came not from Bo Diddley, or even the similarly styled Hambone craze of a few years before, but from his teenage memories of working with Count Otis Matthews' band back in the Berkeley days. The Count used to set up a raggedy old set of drums for Johnny, which would be placed on center stage, and then he'd send him off into the audience to pick out some of the prettiest girls. Johnny would invite the volunteers up onto the rostrum and supply each of them with a set of maracas and shakers. When the band launched into its show-stopping 'shave-and-a-haircut-six-bits' routine, the ladies were encouraged to shake everything they had, making it the highlight of the evening. 'The Johnny Otis Hand Jive' as it was originally known, was recorded the first week of April 1958. The session began with the storming Plas Johnson led 'Ring-A-Ling', then Johnny dispensed with horns and turned the spotlight on his talented guitarist Jimmy Nolen. Get your copy of "The Greatest Johnny Otis Show" today to find out how this ends.